Toll-like receptors (TLRs) are a class of proteins that play a key role in innate immunity. They are single domain trans-membrane receptors belong to pattern recognition receptors (PRRs) which usually expressed in sentinel cells such as macrophages dendritic cells and many other non-immune cells such as fibroblasts and epithelial cells. They recognize structurally conserved molecules derived from microbes which are called pathogen-associated molecular patterns (PAMPs) or self-derived molecules derived from damaged cells, referred as damage associated molecules patterns (DAMPs). PAMPs include various bacterial cell wall components such as lipopolysaccharide (LPS), peptidoglycan (PGN) and lipopeptides, as well as flagellin, bacterial DNA and viral double-stranded RNA. DAMPs include intracellular proteins such as heat shock proteins as well as protein fragments from the extracellular matrix. PRRs activate downstream signaling pathways that lead to the induction of innate immune responses by producing inflammatory cytokines, type I interferon (IFN), and other mediators. These processes not only trigger immediate host defensive responses such as inflammation, but also prime and orchestrate antigen-specific adaptive immune responses. These responses are essential for the clearance of infecting microbes as well as crucial for the consequent instruction of antigen-specific adaptive immune responses. Figure 2. The schematic diagram of the TLRs molecular structure. The TLR family comprises 10 members (TLR1–TLR10) in human and 12 (TLR1–TLR9, TLR11–TLR13) in mouse. TLRs localize to the cell surface or to intracellular compartments such as the ER, endosome and lysosome. Cell surface TLRs include TLR1, TLR2, TLR4, TLR5, TLR6, and TLR10, whereas intracellular TLRs are localized in the endosome and include TLR3, TLR7, TLR8, TLR9, TLR11, TLR12, and TLR13 (Figure 1). Cell surface TLRs mainly recognize microbial membrane components such as lipids, lipoproteins, and proteins. Intracellular TLRs recognize nucleic acids derived from bacteria and viruses, and also recognize self-nucleic acids in disease conditions such as autoimmunity. The function of Toll-like receptor usually based on a dimerization process of two TLR molecules, but not always. For example, TLR-1 and TLR-2 will bind to each other to form a dimmer when recognize PAMPs molecules mainly including lipoproteins, peptidoglycans, lipotechoic acids (LTA, Gram-), zymosan, mannan, and tGPI-mucin. TLR-2 can also form a dimmer with TLR-6 when they recognize the same PAMPs listed above. TLR-4 can recognize lipopolysaccharide (LPS, Gram+) and form a homodimer with another TLR-4 molecule. TLR-5 can recognize bacterial flagellin, but they don’t form a dimmer. TLR-11 is functional in mice and mainly recognize uropathogenic bacterial. TLR-3, 7, 8, 9, 13 are expressed on the endosome surface in the cytoplasm. TLR3 recognizes viral double-stranded RNA (dsRNA), small interfering RNAs, and self-RNAs derived from damaged cells. TLR-7 is predominantly expressed in plasmacytoid DCs (pDCs) and recognizes single-stranded (ss) RNA from viruses. It also recognizes RNA from streptococcus B bacteria in conventional DCs (cDCs). TLR8 responds to viral and bacterial RNA. TLR-9 recognizes bacterial and viral DNA that is rich in unmethylated CpG-DNA motifs. TLR13 recognizes bacterial 23S rRNA and unknown components of vesicular stomatitis virus. Although there are so many types of TLR molecule which recognize wide range of ligands, all these TLRs share a common structural framework in their extracellular, ligand-binding domains. These domains all adopt horseshoe-shaped structures built from leucine-rich repeat motifs. Typically, on ligand binding, two extracellular domains form an ‘‘m’’-shaped dimer sandwiching the ligand molecule bringing the transmembrane and cytoplasmic domains in close proximity and triggering a downstream signaling cascade (Figure 2). Toll-like receptors allow sentinel cells such as macrophages to detect microbes through PAMPs such as LPS. LPS is a component of bacterial cell wall. The mechanism of lipopolysaccharide recognition by Toll-like receptors is complex and require several accessary proteins. A serum protein, LPS-binding protein binds LPS monomers and transfer it to a protein called CD14. CD14 can be soluble or bind to the cell surface through a glycosylphosphatidylinositol anchor. CD 14 delivers and loads LPS to the extracellular domain of Toll-like receptors. TLRs are able to detect LPS with the help of an accessary protein called MD-2. Then homodimerization of TLRs are induced when LPS bind to the complex of TLR-CD14-MD2. 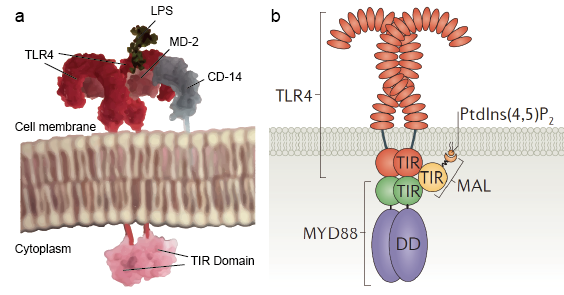 The conformational change of the extracellular domains initiate dimerization of cytoplasmic Toll IL-1 receptor (TIR) domain. The TIR conformational change provide a new scaffold that allows the recruitment of adaptor proteins to form a post receptor signaling complex. The TIR containing an adaptor protein myeloid differentiation primary-response protein 88 (MyD88). MyD88 functions as an adaptor linking TLRs/IL-1Rs with downstream signaling molecules that have DDs. It recognize the conformational change in the TIR domain of the TLRs, binds to the new receptor complex, and transfer the signaling by amino (N)-terminal death domain (DD) interaction with IL-1R-associated kinases (IRAKs). These results a complex cascade with signaling invents that warns the cell of pathogen invasion. There are 4 IRAKs (IRAK 1, 2, 4, M). They contain an N-terminal DD and a central serine/threonine-kinase domain. IRAK1 and IRAK4 have intrinsic kinase activity, whereas IRAK2 and IRAK-M have no detectable kinase activity. IRAK4 activated by MyD88 and it continue to activate IRAK1. IRAK1 then activate the downstream TRAF6. TRAF6 is a member of the tumor necrosis factor receptor (TNFR)-associated factor (TRAF) family that mediates cytokine signaling pathways. Upon stimulation, TRAF6 is recruited to the receptor complex, and activated by IRAK-1 that binds to the TRAF domain of TRAF6. Then, the IRAK-1/TRAF6 complex dissociates from the receptor and associates with TGF-beta-activated kinase 1 (TAK1) and TAK1-binding proteins, TAB1 and TAB2. The complex of TRAF6, TAK1, TAB1, and TAB2 moves into the cytoplasm, where it forms a large complex with other proteins, such as the E2 ligases Ubc13 and Uev1A. The Ubc13 and Uev1A complex has been shown to catalyze the synthesis of a Lys 63-linked polyubiquitin chain of TRAF6 and thereby induce TRAF6-mediated activation of TAK1 and finally of NF-kB. These signal pathway described above are called MyD88-dependent pathway as the signal is starting from the MyD88 molecule. There is also another pathway called MyD88-independedt pathway, which signaling is not starting from MyD88. Instead, the signal starting from TRIF protein. TRIF interacts with TRAF6 and TRAF3.TRAF6 recruits the kinase RIP-1, which in turn interacts with and activates the TAK1 complex, leading to activation of NF-kB and MAPKs and induction of inflammatory cytokines. In contrast, TRAF3 recruits the IKK-related kinasesTBK1 and IKKi along with NEMO for IRF3 phosphorylation and activation. IRF3 forms a dimer and translocates into the nucleus from the cytoplasm, induces the expression of type I IFN. NF-kB signaling pathway, P38 signaling pathway and MAKP signaling pathway. Of cause there some negative regulation by a number of molecules through various mechanisms to prevent or terminate the excessive immune responses that lead to detrimental consequences associated with autoimmunity and inflammatory disease. Activation of the MyD88-dependent pathway is suppressed by ST2825, SOCS1, and Cbl-b, and activation of the TRIF-dependent pathway is suppressed by SARM and TAG. These molecules associate with MyD88 or TRIF to prevent them from binding to TLRs or downstream molecules. TRAF3 activation is negatively regulated by SOCS3 and DUBA. TRAF6 is targeted by a number of inhibitory molecules such as A20, USP4, CYLD, TANK, TRIM38 and SHP. TAK1 activation is inhibited by TRIM30a and A20. As TLR is involved in LPS sensing and it could have a role in sepsis, targeting of TLRs is important for the treatment of several diseases. In addition to interfering with TLR responses to treat pathogen infections, an obvious clinical application of the knowledge gained from TLR studies was to use TLR ligands as vaccine adjuvants. Moreover, TLR inhibition has also been attempted in the clinic, the goal of which is to limit excessive inflammation that is presumably driven by the over activation of a particular TLR. 1. Takeda, Kiyoshi, and Shizuo Akira. "TLR signaling pathways." Seminars in immunology. Vol. 16. No. 1. Academic Press, 2004. 2. Akira, Shizuo, and Kiyoshi Takeda. "Toll-like receptor signalling." Nature reviews immunology 4.7 (2004): 499-511. 3. Lim, Kian-Huat, and Louis M. Staudt. "Toll-like receptor signaling." Cold Spring Harbor perspectives in biology 5.1 (2013): a011247. 4. andTaro Kawai, Takumi Kawasaki. "Toll-like receptor signaling pathways." Pattern Recognition Receptors and Cancer 8916 (2015): 7. 5. Gay, Nicholas J., et al. "Assembly and localization of Toll-like receptor signalling complexes." Nature reviews Immunology 14.8 (2014): 546-558. 6. O'Neill, Luke AJ, Douglas Golenbock, and Andrew G. Bowie. "The history of Toll-like receptors [mdash] redefining innate immunity." Nature Reviews Immunology 13.6 (2013): 453-460. 7. Botos, Istvan, David M. Segal, and David R. Davies. "The structural biology of Toll-like receptors." Structure 19.4 (2011): 447-459.